The purpose of the Moose Riders is to be a social and civic activity group for members whose main concern shall be the support of Mooseheart, Moosehaven, local charities, and local branches of worthy national charities through motorcycling and volunteer work, as well as the social enhancement of their Lodge and Chapter. Applications are available on the Moose Rider bulletin board at the lodge. Our Membership fee is $5.00. All activities are posted on our bulletin board and on our Facebook page: Moose Riders Lodge 720. If you need more information, please call the President or Vice President at the above numbers. Moose International has joined together with service organizations and volunteers across the globe to partner in an International Week of Service to improve our communities. As we take on many challenges facing us today, we create personal bonds and friendships with other community members and volunteers. It is in this spirit that we ask your club to invite another local service group to volunteer with you during the last week of March. Information and resources for this event can be found at weekofservice.org. Also, visit the International Week of Service 2017 Facebook Event to RSVP and see what other clubs are planning. Organizations participating in this event include: Moose International, Lions Clubs International, Rotary International, Optimist International, Junior Chamber International, Kiwanis International, Soroptimist, Y's Men International, Pilot International, Sertoma Inc., National AMBUCS and The National Exchange Club. We simply ask that your club work with one or more other area service groups to do something together for your community. This can be an activity that is already planned for that week or something new. Then share your photos and videos from this activity at weekofservice.org, on the Facebook Event and on social media with the hashtag #weekofservice2017. Also, complete the fill-in-the-blank press release available at weekofservice.org and send it with a photo to your local media. In addition to helping more people and communities in one week than ever before, this event will help us to promote all of our organizations, highlight membership opportunities and reinforce the importance of civic engagement and individual social responsibility. It is a chance for our volunteers to forge lasting relationships – further enabling prospects for future joint projects. Join us in this partnership as we serve together like never before! To assist you in our efforts to have a gain in membership, we are offering two promotions in addition to the Moose - Back to Basics membership campaigns. $0 Application Fee beginning March 1. The Supreme Council has authorized the General Governor to issue a blanket dispensation to waive all application fees in March and April. This will likely be the last time the fees will be waived and will provide momentum for the lodges as they look to move into the new year on a positive note. No fees will be collected or billed, meaning MI will be waiving the $10 it has been collecting throughout this year, and the lodges will no longer collect $10 that they have, in theory, been retaining for membership campaign purposes. We are extending the King of Hearts membership promotion through the end of the fiscal year. All members who sponsor a new or former member by April 30th will receive a credit to play the game for each individual they sponsor. Further, although the sponsorship period ends on April 30th, they will have the ability to go online and play the game through May 10th. To date, nearly 1,000 members have played and over $6,000 in promotional prizes have been distributed. Materials will be available on-line by the end of the week, plus printed material, including short-term campaign posters, are being sent within the next week or so. Best of luck to every Lodge, Chapter and Moose Legion in your efforts to end the year with a plus one! In July, the Loyal Order of Moose and the Women of the Moose both announced year-end gains in active membership during the 2012 Annual Convention, with the Moose Legion just missing the mark. To keep this positive momentum going, the Supreme Council has authorized General Governor Steve Greene to issue a blanket dispensation to waive all membership application fees for the three fraternal units to begin on December 17th, 2012 through April 30th, 2013. 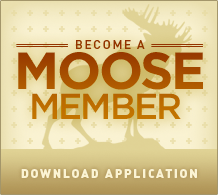 No application fee will be required for any membership application transmitted to Moose International between 12:01a.m. (CST) Monday, December 17, 2012, and 10:00 p.m. (CST) Tuesday, April 30, 2013 (provided the application received date is on/or after December 17th.) Completed applications must be remitted with full first-year dues. Additionally, applicants must be reported as "enrolled" by 10:00 p.m. on Friday, May 31, 2013, otherwise, the fraternal unit will be retroactively billed for all applications reported during the $0 application fee incentive period, but not enrolled prior to May 31. The holidays are an excellent time to connect with friends and relatives, and to invite qualified individuals to join you as brothers, co-workers and Moose Legionnaires with the Moose! And remember, members that sponsor two applicants between May 1, 2012 and April 30, 2013 will receive FREE DUES for one year, provided these applicants are reported as enrolled by 10:00 p.m. (CST) on Tuesday, April, 30, 2013. For more information, please contact Moose Member Services at memberservices@mooseintl.org or by phone at 630-906-3658. We the Pennsylvania Moose membership approved the donation of $25,000.00 to the Gettysburg Foundation for the restoration of the Pennsylvania Memorial at the Gettysburg Battle Field in preparation of the 150 year celebration in 2013. The Gettysburg Foundation has already completed the restoration and now we need to keep our promise and donate the funds we promised to keep our Pennsylvania history alive and available for our children and grand children for years to come! This is a large Community service by us the members of the Pennsylvania Moose in our own state and now we need your help with your donations to the PMA marked in the memo of your check Gettysburg Foundation. Any amount will be appreciated by the PMA and the Gettysburg Foundation no matter the amount. We figure for the lodges a rule of thumb would be 40 cents a member but if you feel this isn't sufficient then by all means send more! We will be excepting donations from all of the Pennsylvania Moose Membership, men, women and Moose Legions. If your Lodge, District, Chapter, Moose Legion, or an individual member, has already donated we thank you. We have received donations of $1500.00 as of my last report, 6 lodges Lewistown F.C. 143, Jersey Shore F.C.214, Houtzdale 327, Elkland 746, Pittston 1207 and New Bethlehem 366, one District.#11 and one chapter Williamsport 384. To these lodges, chapter and District we say thank you! Brothers and Co-Workers this Community Service to preserve your history of the Civil War at the Gettysburg Battlefield is not mandatory but we are asking your help to preserve your history and do some good in your own state of Pennsylvania! If you have an activity in your lodge, chapter or Moose legion and ear mark the profits for the Gettysburg Battlefield Pennsylvania Memorial restoration. We are proud of our Pennsylvania Moose Members and we know you can do anything you set your mind to! Please send all donations to PMA Secretary, Rick King, 6257 Tuscarora Drive, Huntingdon, Pa 16652 and mark all donations Gettysburg Foundation. Now is your time to step up and show your Pennsylvania Moose pride! I will do my best to try and keep everyone updated on how the donations are going. Remember brothers and Co-workers this is your history and your chance to shine! McSherrystown Moose Lodge #720. All rights reserved. Site designed by BRETT KEENEY.